Uh-0h. I have been bad about getting on and updating. Over a year since I made the big words about updating and adding stuff. I have been taking pictures all along and have some things to add. Life has been kicking my hobby down the stairs...no excuse. Part of my grand scheme was to cut down on and get some things done at home on a more timely manner. So much has came out from TSSD, Conte, Barzo, FOV...I have some of it, but only samples... The only show that is close by (Atlanta), I missed last year. I did do some stuff with soldiers at church- 54mm Firey Furnace for the kids and a pirate ship battle for Halloween. I did video of the pirate battle, but when edited it was too big for YouTube to allow. I will cut it down and get it posted. I cleaned up all of the postings for cheap diazapam and steroids from the visitors' section. Sorry if you missed a deal, it is illegal. Go to Target and get some Forces of Valor stuff, you will feel better. Until I get the garage cleaned...Good Hunting! When will this guy update? I apologize if you have been looking for something new on the site. I just spent some time in the toy room setting up for some visitors and taking some pictures. I hope to get them on soon. I have been thinking about some casting and will attempt to locate some materials tomorrow. I have been working on a major conversion and want to cast it when it is finished. 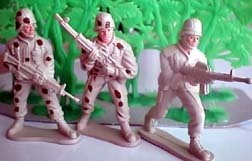 I have some Airfix Ski Troops that need some feet also. Stay tuned. Our country is still in the conflict against terrorism. I have good friends in theatre now. We keep them in our prayers constantly. We know the fight is a good fight. Update to come...thanks for checking in. Wow. My mobilization has finally reached its end. The year at times seemed to drag on forever and at times flew by. I have been off the past few weeks taking my leave before returning to my job. The war has no end in sight, we have a maniac sniper on the loose, the North Koreans have nukes and some maniacs in Russia have taken about 700 hostages. The world continues to be an ugly place. If we don't have some hobbies to occupy our minds we will rot from stomach ulcers. 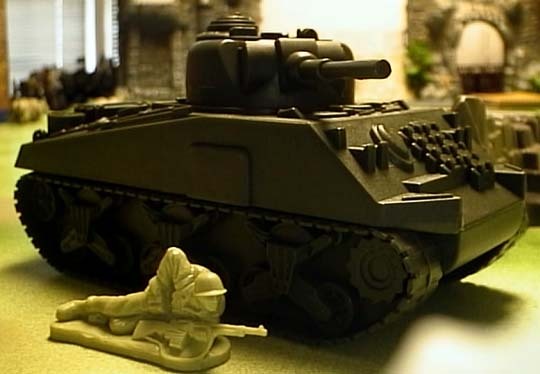 The Toy Soldier world appears to be moving along OK. 21st Centurty has more 1/32d stuff out. I have been painting in my off time. I conducted a small clinic for Monkey06 and one of his soccer buddies a couple of weeks ago. I will post those results on Monkey06's page of the Outpost. One of my recent acquisitions was an R/C sailboat which I immediately picked out a crew from my Ideal pirates. Even though the ship is of modern style, I feel the pirates fit right onboard. I have some plans on repainting it to make it look a little like an island raiding sloop. Stay tuned. Take a look at the conversion page, I have added a couple of items there. Until the next update, take care. Holy cow! It has been a long time since the last update...the Homeland Mission comes first. Summer is coming to a close and I have some more stuff to add to the site. Amongst the additions are a couple of accessories found in the most oddest of places: the garden shop at Walmart! First I found a resin flower box that would double as a castle keep or a chapel in any time period. It is paintable and can be cut to add to it's usefulness. In the pictures you can see the detail on the outside, stones, wood and foliage which takes no time and little paint to bring out. The interior walls are molded exactly where the doors are, but they can be cut to form a variety of room layouts. I may attempt to cut out one of the doors later on. 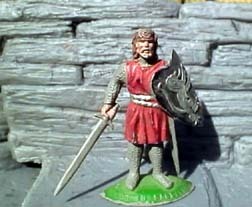 The Vikings are 60mm Cherilea and an Elastolin copy. The other item found at Walmart is a flower bed border which makes a perfect castle, rock formation, sea wall, etc...I have pictured it with a 54mm Timpo knight to give you an idea of the size. This is a nice set, it comes with 10 pieces and snaps together. It would make an excellent display backdrop due to it's length and flat surfaces. 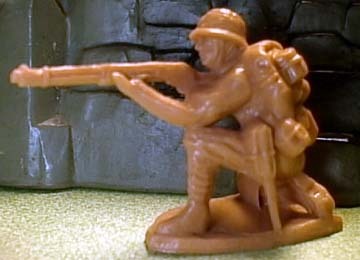 I bought my wife her first toy soldier set for Mother's Day. 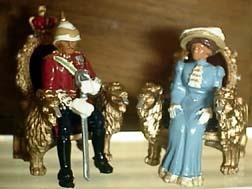 From Britains, I got the Lord and Lady Cuzon for her. She was surprisingly happy. Sad news as STADS has decided to call it quits. 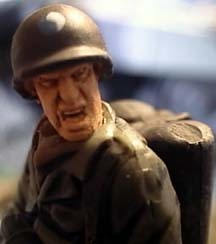 His business has been a source of unusual and hard to find soldiers for my collection for quite a few years. The grammatically challenged "Comment Time" was always a big part of his lists and website for me. I met Paul after years of telephone business in London. It was at the Plastic Warrior Show as the show opened. The hall was rapidly filling and the bargains were being snapped up. I heard the voice first. I introduced myself and we spoke briefly, then he was away clutching soon to be full shopping bags. STAD's will be missed. Keep the website Paul, put up some photos of your collection. Read the book. See the movie. Repeat until you have a healthy respect for the soldiers of the Ranger Regiment,Delta Operators, SOAR and the AF PJ's. Don't concern yourself with the PC that so many folks are trying to slap onto this film. Those guys would have fought just as hard in Norway or Bosnia. Remember some of the same folks (and many just like them) are currently operating in Afghanistan rooting out the terrorists that attacked us on 11SEP01. They are brave, special people. I will continue to put up stuff as I can. I am still doing the Homeland Defense mission. In my lane, I can tell you, are some of the best cavalrymen around protecting our national interest within our borders. They are special folks too. The poses (may be more) are pretty good. Below is the same guy with the right guy sporting a little off the top. This makes him look a ton better. The attacks on 11SEP have placed a huge change on all of our lives. My situation has changed as I find myself on active duty with my National Guard unit. As our nation continues to pursue those responsible for this attack, we must remember that our liberty comes with a price. The price is already high, but to settle for anything less would be to give in. Giving in to murderers and thieves will accomplish nothing. I urge all involved in the aftermath of the attacks, military, police, firefighters, and government employees to stay the course. If you don't fit into these catagories, then let these folks know you care. And of course, pray. Well, another month slipped by...rats! I have been busy, but outside the toy room. As a gag gift for my 40th birthday,someone gave me a gift card from ToysRUs. 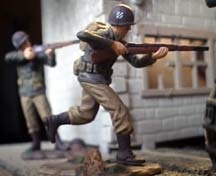 I put it to good use as 21st Century has released their 1/32nd line. I picked up the Germans and US Troops with my gift card. 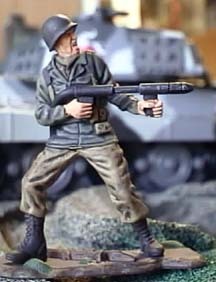 My thoughts on them:Overall-kind of brittle for toys... Germans...sure are a lot of pistols issued to 'em...several troops with holsters. 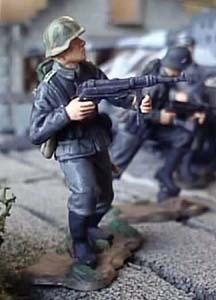 The MP40 guys are equipped with K98 pouches. 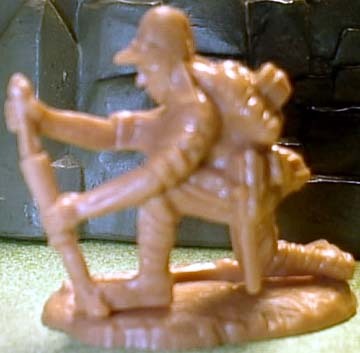 The kneeling rifleman has an odd look to his arms...not a very good job there. On the up-side however: the faces and painting are top-notch! 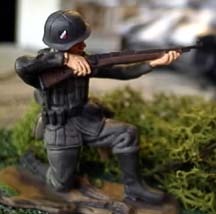 I really like the running MP40 gunner. 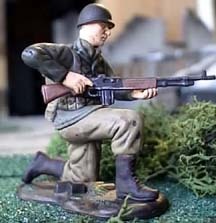 Americans...the M1 Garand barrels leave much to be desired, the grenade thrower's arms are very long, on the up-side: the division patches (29th and 3rd Infantry) are excellent. 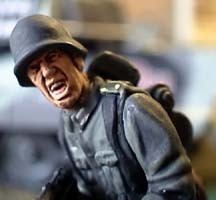 The paint,poses, detail and faces are great too. 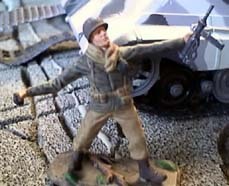 One of the poses on the box art did not make it into the box, a wounded G.I. 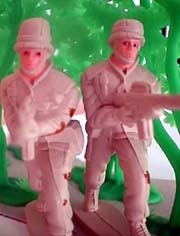 I have just added a page: Army Men...Our Plastic Protectors. The Marx guys on this page came to me in a way most collectors only dream of. We moved across the country to a rental house. I was rooting around in the attic and found a box. Inside the box was the old Marx figures and some older Timmee Western figures all were in pretty good shape. The house owner knew nothing of the soldiers. So, they became part of my collection. I know the pictures are not the best and I will fix that as soon as I can. My digital camera is a bit on the basic side, so getting clear shots can be a chore. 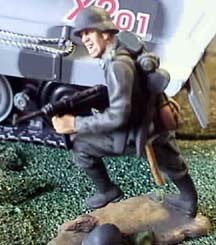 I recently scored one of the 21st Century Stalingrad Panzer Grenadier promo figures. This is the "buy two, get the third for a penny" deal at KayBee Toys. It is very nice, armed with a PPSH41 and a spare pair of gloved hands. The uniform is reversible and he comes with a tunic underneath his coat. 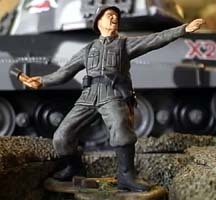 I also noticed in KB that Hasbro has some new Axis Powers figures. I saw the Japanese Air Officer, not too bad. 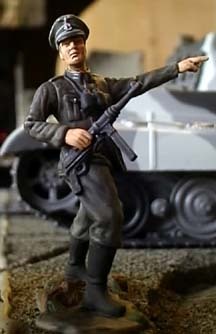 I saw on box art a German Panzer Sergeant Major figure is offered too. Kind of an odd offering, an air force officer and a panzer sergeant major...I guess it beats another SEAL or SWAT guy. 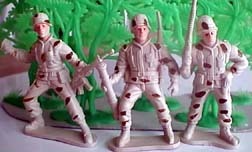 Come on, Special Ops is being covered way too much...On the 54mm side, nothing much new is happening...I want to make my pirate page some time...just finding the time...what do you want to see? Email me or leave some feedback...thanks for looking. Good hunting. I made the white sheet out of a t-shirt...you can see the gloved hands and PPSH41 that comes with the figure. 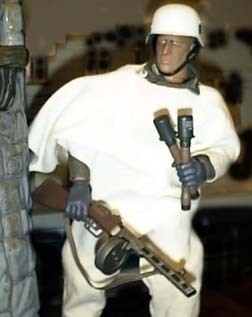 I plan on using the parka on another figure to give me two Stalingrad troops.